Ghirlandaio's "An Old Man and His Grandson"
One of my favorite portraits is in this exhibition, a Renaissance classic and standard in art history books, "An Old Man and His Grandson" by Domenico Ghirlandaio, 1480, on loan from the Louvre. The obvious thing that makes this piece stand out is the grandfather's nose, riddled with lumps from a sinus disease. Compositionally it's interesting to note that the nose is in the exact center of the painting. The second thing that stands out about it is the pose. It's one of the most naturalistic portraits of the time, informal like a snapshot rather than a posed portrait. The thing I love about this painting is this: ever watch grandparents and grandchildren? No matter how old, fat, unattractive, immobile, unhappy, missing teeth or hair, uneducated, or smelling like mothballs the grandparent is, no matter how many negatives about that grandparent -- the kid doesn't care. It's pure love. And it goes both ways. Look at the grandson in this painting. He is not fazed one bit by his grandfather's appearance. He might stare, he might ask about those lumps with a child's naivete, but it does not impact his love one iota. As for grandpa, can't you sense his love and patience towards the kid? This is a timeless painting. I can walk to any park in the world and see this same image from 1480 acted out every day, and Ghirlandaio nailed it here. Emotional impact aside, the painting itself is excellent, and the overpowering presence of the two figures overshadows the classic landscape outside the window. One can attempt an argument that it's a bit of a trompe l'oeil of a landscape painting and not a window, but most agree it's not. Don't miss the chance to see this and other classic Renaissance portraits if you are in the NY area. Ghirlandaio, Domenico (1449-94). Florentine painter. He trained with Baldovinetti and possibly with Verrocchio. His style was solid, prosaic, and rather old-fashioned (especially when compared with that of his great contemporary Botticelli), but he was an excellent craftsman and good businessman and had one of the most prosperous workshops in Florence. This he ran in collaboration with his two younger brothers, Benedetto (1458-97) and Davide (1452-1525). His largest undertaking was the fresco cycle in the choir of Sta Maria Novella, Florence, illustrating Scenes from the Lives of the Virgin and St John the Baptist (1486-90). This was commissioned by Giovanni Tornabuoni, a partner in the Medici bank, and Ghirlandaio depicts the sacred story as if it had taken place in the home of a wealthy Florentine burgher. It is this talent for portraying the life and manners of his time (he often included portraits in his religious works) that has made Ghirlandaio popular with many visitors to Florence. But he also had considerable skill in the management of complex compositions and a certain grandeur of conception that sometimes hints at the High Renaissance. Ghirlandaio worked on frescos in Pisa, San Gimignano, and Rome (in the Sistine Chapel) as well as in Florence, and his studio produced numerous altarpieces. 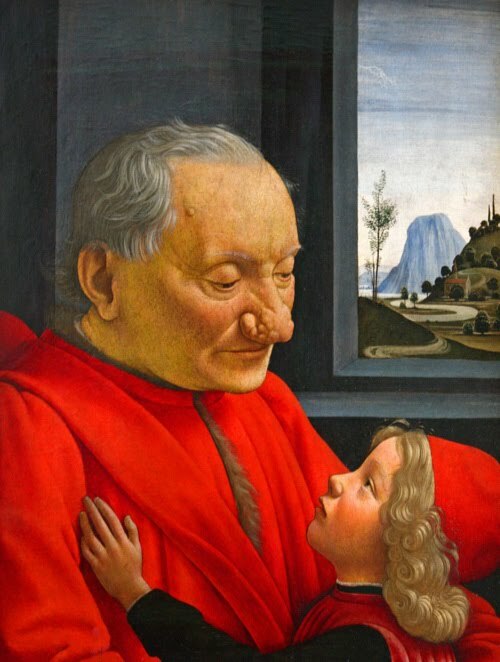 He also painted portraits, the finest of which is Old Man and his Grandson (Louvre); this depicts the grandfather's diseased features with ruthless realism, but has a remarkable air of tenderness. Ghirlandaio's son and pupil Ridolfo (1483-1561) was a friend of Raphael and a portrait painter of some distinction. His most famous pupil, however, was Michelangelo.